Yarbrough, Margaret Louise, 83, of Louisville died Wednesday January 30, 2019 at the Hosparus Inpatient Care Center. She was a retired employee of the Colgate Palmolive Co. She was preceded in death by a daughter Zandra Moppins; two sons Larry Moppins and Victor Yarbrough. 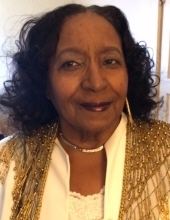 She is survived by two daughters Kim L. Yarbrough and Connie Yarbrough; a son Rodney T. Moppins (Marilyn); a stepdaughter Jacqueline Yarbrough-Hall; 13 grandchildren; 13 great grandchildren and 1 great great grandchild. Her funeral service will be held 1:00 p.m. Tuesday February 5, 2019 at Greater Friendship Missionary Baptist Church 2325 Osage Ave., with burial in Green Meadows Cemetery. Visitation will be 11:00 a.m. to 1:00 p.m. Tuesday at the Church. To send flowers or a remembrance gift to the family of Margaret Louise Yarbrough, please visit our Tribute Store. "Email Address" would like to share the life celebration of Margaret Louise Yarbrough. Click on the "link" to go to share a favorite memory or leave a condolence message for the family.